The Optical Foundation as it is today, is the brainchild of Dr Carolina Kunnen. But like most historical events, the story starts long before there was even a hint of a concept, let alone a founding date. As an 8-year-old girl Carolina was looking at pictures of her grandparents travels in Ghana. Her grandparents had travelled to Ghana in the 1960’s to visit her great-uncle who was living there at the time and had set up the first secondary school in Northern Ghana. She was so inspired, curious and determined that one day she would travel to Ghana. When in 2005, Carolina was working as an optometrist for Lens BV she was introduced to Arthur Alberts, a Dutch optometrist, who was looking for somebody to help him get The Optical Foundation he had founded in 2004 off the ground. Carolina was immediately enthusiastic about what The Optical Foundation potentially could mean for the people in Ghana and was happy to assist in whichever way she could, even before she joined the foundation. In 2006 Carolina officially joined the organisation and in February 2007 at the age of 24 she not only launched The Optical Foundation’s first project, but also became the organisation’s first volunteer to run a project in Ghana. As she had never travel to Africa before, Huub Villevoye, the organisation’s treasure and seasoned traveller accompanied her for the first two weeks and from then onward, she was on her own. Spending almost a year in Ghana, Carolina firmly established The Optical Foundation’s presence through the relationships she built at the University of Cape Coast, local eye clinics and other contacts she made during the initial stages of her stay. She laid the foundations for the organisation’s direction when she started lecturing and helping with the practical classes at the University of Cape Coast, while waiting for the eye examination equipment to arrive in Ghana. 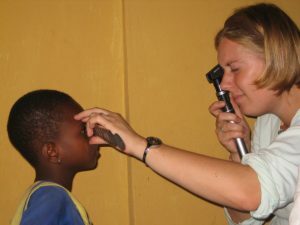 It was during this time she found out how little practical experience the Ghanaian optometry students were getting, so when the equipment arrived she decided to include optometry students as a component of the program, by allowing them to perform the comprehensive eye examinations under her supervision and guidance. This is when the idea, that ‘enhancing’ education had to be a component of The Optical Foundation’s mission, was born! On her return to the Netherlands in 2008 Carolina took on the role of President of The Optical Foundation and she still holds this position. In the mean time our team has grown both in numbers and enthusiasm, and we continue to write The Optical Foundation’s story with every optometry student’s education we enhance and every child’s vision we help save.